Life on the throne can be pretty sweet. People know that they have to do what you want. For instance, when you had your subjects landscape your front yard they had the audacity to plant white roses. They knew you wanted red roses. If they had simply thought it over they would have known that you love the color red. Still, it's pretty nice to have people ready to bend to your every whim. On a nice Saturday, you can be found in the backyard playing croquet with all your friends. Now, you wouldn't say that they're letting you win, but we certainly wouldn't say that anyone is trying to beat you either. Who wants to get competitive with someone who is interested in beheading her subjects? 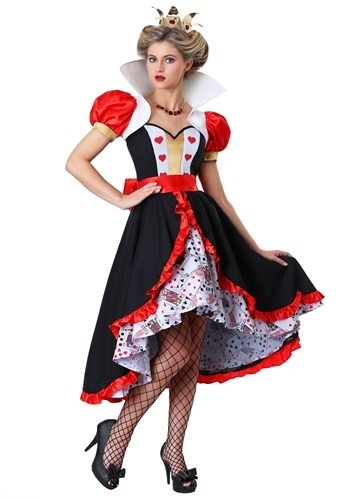 Make your Wonderland look unique with this exclusive flirty Queen of Hearts costume. This Made-By-Us costume will make you feel like an in control monarch of a topsy-turvy kingdom. The underskirt is peppered with scattered playing cards. The black and red layered skirt on top ruffles up to the waist, giving it plenty of twirl factor. The bodice has a clean, cartoonish look with a gold center and hearts on the sides. The jacket has red puffed sleeves and a tall white collar. In a skirt with this much twirl factor, don't be surprised when this costume makes you want to dance. If P.E.T.A. went to the Queen of Hearts castle, they'd have some serious issues with the way she plays croquet! So instead of training one of those rare pink birds, check out our selection of Wonderland props. Someone who goes all out in an outfit this gorgeous deserves a bird that will behave through all the hoops of the game!